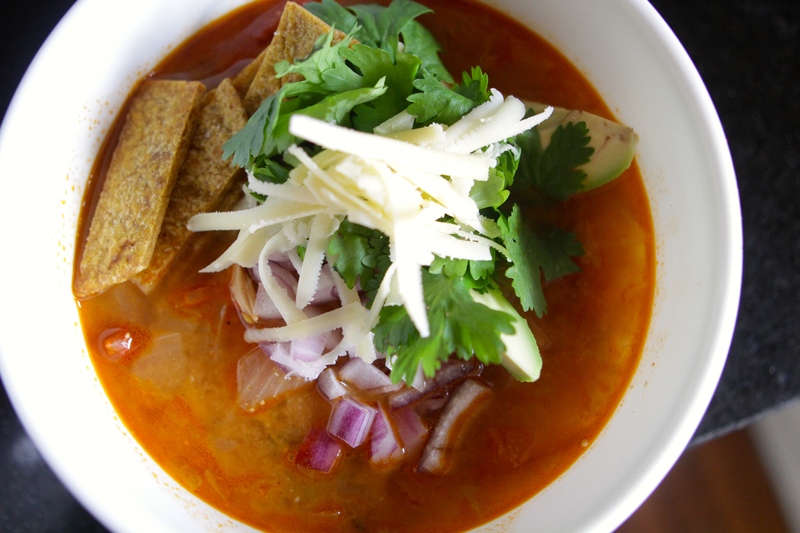 Tortilla Soup makes for a fun weeknight dinner, with its infinite variations of toppings. The base of the soup too can be made any number of ways, fresh tomatoes or canned, leftover rotisserie chicken or freshly cooked bone-in breasts shredded right into the pot, chipotle peppers or ancho chiles or jalapeños, or all three. My favorite part of this dish (besides the eating part) is the assembly at the table, which makes for a fun dinner party activity or an interactive kids meal. In a stockpot, heat the olive oil. Add the onion, garlic, celery, bell pepper, carrots, jalapeño, cumin, chili powder and salt and sauté until onion is translucent and vegetables begin to soften. Pour in the chicken stock, shredded chicken, canned tomatoes and black beans and bring the whole pot to a boil. Once boiling, lower the heat to a simmer and cook 30-45 minutes. Test for seasoning and be generous with cumin and chili until desired spice is reached. To serve, ladle into soup bowls and pile high with condiments, including a good squeeze of lime juice.